Did you know, in the United States, there are 60 million people with acne, but only 10% see a dermatologist?! The other 90% rely on medicine they buy online or at drug stores, which are one-size-fits-all products not customized to their skin. These range from being ineffective to actually exacerbating acne. San Francisco based MDacne is the brand disrupting the treatment process of acne, alleviating a doctor’s visit and utilizing technology to analyze a user’s skin (by the co-founder and a board certified dermatologist), then based on the analysis, subscribers will get customized anti-acne medications that are specifically personalized to their skin type and acne severity. The subscription service will help users treat and maintain their acne until it is no longer an issue. After a new user downloads the app, they answer a few questions and take a selfie. 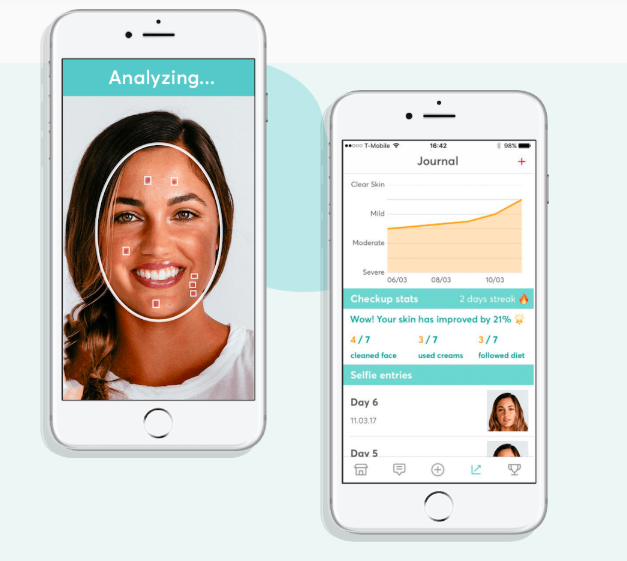 The selfie is analyzed with computer vision and deep learning technology, and the user receives a full analysis of their skin type and acne condition. The download and analysis is free. Users continue to take selfies to monitor acne progress. If there is no improvement, MDacne will continue to adjust the medication until the user achieves clear skin. The app also provides skin tips, recommended diets, and ongoing selfie charts so users can track their progress. Over the past 10 years, the average age of an acne sufferer has increased from 20.5 years old to 26.5 years old. One other interesting fact about MDacne is it was founded by a father/son duo. Oded Harth (CEO) has a tech background and his father, Dr. Yoram Harth has been practicing dermatology for more than 30 years. For the month of June MDacne will be offering a discount code for 30% off (AcneMonth) and will be donating 10% of all proceeds to the Anxiety and Depression Association of America.